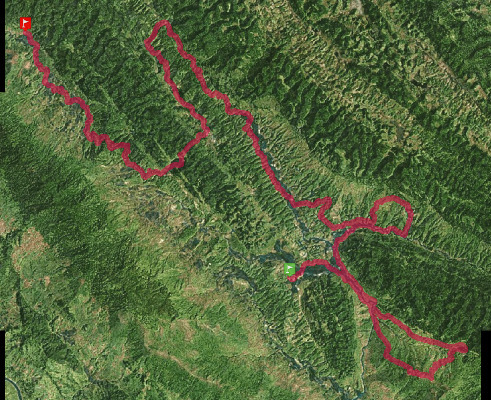 This is a very challenging 70km ultra-trail Marathon with plenty of climbs and descents and gain of over 3,000m. It will take runners through all of the landscapes that the Nature Reserve has to offer. Racers will start running with strong headlamps into the darkness and soon the long first climb up to Bo Dieu village will begin. This is a very serious and steep climb which it is not possible to run up. Runners must conserve their energy here! At the top the route turns downhill onto a descent into the river valley. As the sun rises runners will race into the picturesque village of Ban Hieu. This fairytale settlement features traditional stilt houses which dot the hillside and a turquoise river with rapids and waterfalls which cascades down to the valley floor. After reaching the top of the climb you will enjoy sweeping views of the valley before descending back down to link up with the 42km route. Following the small village of Ban Nua a rolling section on a quiet, concrete route includes plenty of climbing as you head deeper into the nature reserve with thick jungle on either side. Having passed by Ban Cao Hoong village the route arrives at the tiny settlement of Ban Kit. From here on the race goes truly remote. Next you will head onto small off-road trails climbing to up to Thanh Cong village and then a tough jungle section follows with some narrow, technical trail and a climb we like to call ‘The Spike’. Before reaching Kho Muong you will be rewarded with an utterly spectacular view of a valley ringed with incredibly steep, jungled limestone mountains. During the end of May, the colours of the rice fields are beautiful, so the knockout views from the lookout point will make all but the most fiercely competitive stop for a photo opportunity. The descent down to the valley here is very technical and will require care. Once down in the valley a flat section of beautiful trail leads through the picturesque village of Kho Muong from where you will face a long final climb before a short hilly tarmac section. After descending back down into the Nature Reserve on ‘wonder trails’ you will reach another small settlement and from here you are on the finishing stretch of trail through a breathtaking valley. After crossing some bamboo and wood bridges you will be on the home run to the Ban Hang Race Village where a well deserved meal and the finish party await.